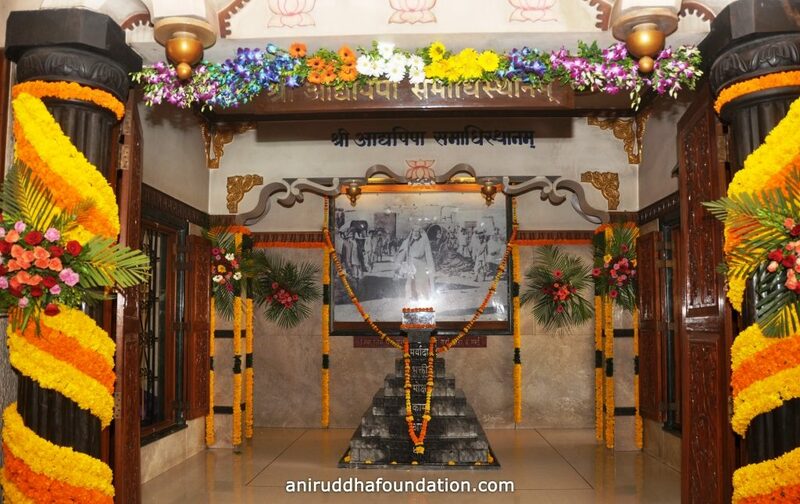 The occasion of Aadyapipa Samadhi Sthan Sthapana Sohala is being observed since the year 2007; celebrated every year on 19th April in memory of Shree Aadypipa. It is the day when the memorial to commemorate him was unveiled. Shri. Sureshchandra dattopadhye, the father of Param Pujya Suchitdada and Pujya Samirdada was ordained ‘Aadyapipa’. It was in the year 1940, at the age of seven years that Aadyapipa’s father took him to Shirdi. Here he gave him Udi and told him about its importance. From that day onward, little Sureshchandra vowed to himself in Sai’s presence that he will serve Sainath with utmost humility and always remain humble. Reading, reflecting and meditating on Shree Sai Satcharita became his life’s journey for next sixty years and it blossomed the treasure of bhakti in him. Aadyapipa firmly believed that when on the path of Bhakti (devotion), one has to remain down to earth and humble, metaphorically speaking small like an ant. He referred to it as ‘Pipilika Path’. This path seizes to be with you with increase in size (ego). It is a key to success in life. Pipilika Path is nothing but being child of the God in the very same way as one is child of his mother. Aadyapipa realized this and practiced it for all his life. He stayed away from acclaims, publicity and respects. But it was on the 13th November 2000 that Sadguru Aniruddha Bapu ordained him as the Pipa (Pipalika Panthastha). Aadyapipa passed away on 26th August 2005, the day of Gokulashthami. Every year on this day he used to complete one of the many readings of his beloved Sai Satcharita. 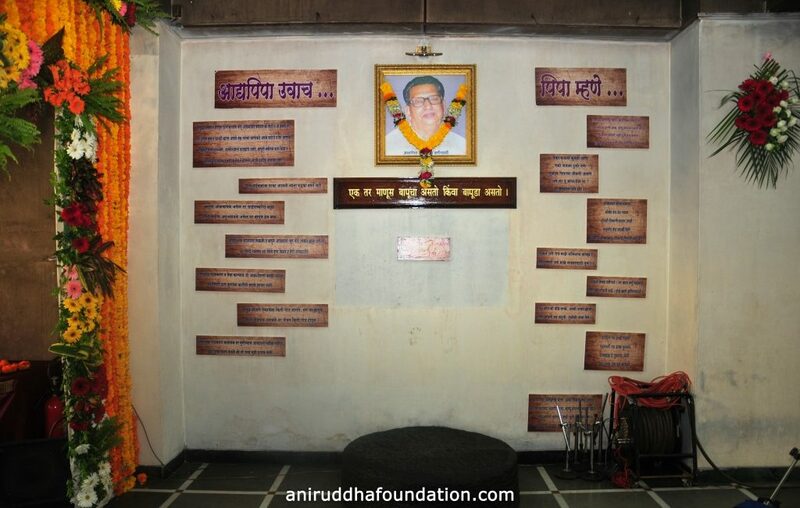 After his passing away, a memorial was built in his honour at Shree Kshetra Juinagar. On the 19th of April 2007, in the presence of Sadguru Aniruddha Bapu, Nandai Aadyapipa’s sons Suchit dada and Samir dada and his wife, Smt. Shubhada Kaku, this memorial was inaugurated for public. 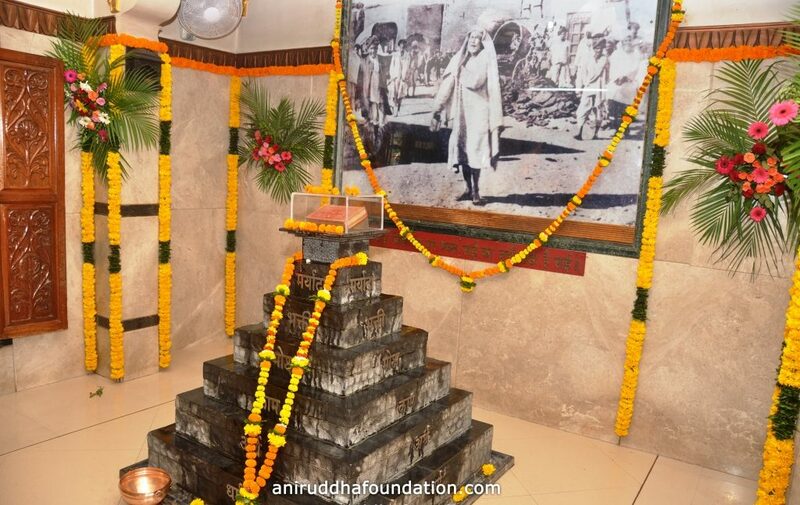 The Udi Aadyapipa’s father had received from Sadguru Sainath which he passed to Aadyapipa and also the Udi that Aadyapipa had received from Aniruddha Bapu is kept in the Samadhi Sthan. The Samadhi memorial has six steps, each representing – Dharma, Artha, Kama, Moksha, Bhakti and Maryada, the six steps to reach Purushartha (Perfection). A copy of Shree Sai Satcharita that Aadyapipa used to read every day has been placed a top the Samadhi. Placed behind the Samadhi is a photograph of Shree Sainath going on His rounds for mendicancy (Bhiksha). A stone platform has been placed facing the Samadhi. Here a person can accept his wrong doings before the frame of Sainath by catching his ears while performing a light jump. How the memorial day is celebrated? Every year on 19thApril the Samadhi is given the ritual bath followed by the ceremonies of Sai Sahastra Pujan and milk bath or Abhishek. The eleventh chapter of Shree Sai Satcharita in voice of Param Pujya Suchit dada is played as the rituals take place. This is followed by anointing the Samadhi with perfume and then food is offered. Later, ‘Aarti Saibaba’ is played in Suchit dada’s voice and odes in praise of the Lord are sung after which devotees can avail darshan of the Samadhi Sthan. On this day, compositions by Aadyapipa in honour of Sadguru Aniruddha Bapu are sung by the devotees.